A couple of weeks ago, my family got carry-out from one of our favorite Asian restaurants. We ordered Chinese-style chicken curry, fish stir-fried with garlic and scallions, a dish made with crushed tofu and mushrooms, and a plate of salt-and-pepper squid — a tangle of tiny deep-fried tentacles that looked very much like the climactic scene of a horror movie just before the hero tosses a bomb and runs away. My 8-year-old went, as he always has, right for the squid. We didn't set out to raise a junior foodie, a youthful gourmand who when asked to name his favorite food couldn't decide between seaweed salad and stewed pig ear (to be fair, he's also never seen a chili dog he didn't like, and he would sell his soul for a bag of Doritos). It just happened that way. And now we have a second child. We started talking about what foods she might be eating in a few months, and I realized that maybe we hadn't been completely passive actors in turning my son into the wunderkind of East Avenue Wegmans, where he has a reputation with the demo folks of being The Kid Who Eats Everything, including the sorts of cheeses that bring to mind rotting feet. Various factors determine what kids will and will not eat. But research by child nutritionists and psychologists suggests that a big part of it has to do with what parents feed them — and what those parents eat themselves. You don't need to infantilize your child's appetite. Read on for some kid-friendly takes on adult dishes that will keep your kids well fed and poised to appreciate more interesting cuisines as they get older. Like all babies, our son's first food was breast milk. He nursed pretty much exclusively until he was 5 months old. He then transitioned to rice cereal, the first solid-food stop for pretty much every baby. And then we entered the uncomfortable world of baby food — mashed-up carrots, sweet potatoes, pears, extra-fine apple sauce, and things I really don't want to think about, like grey-green mashed peas and long-ago-green beans. I wasn't surprised to realize that I'd blocked most of that period out of my memory, choosing instead to remember the moment when feeding my then-toddler son started to get interesting. It started with an avocado. When it comes to a perfect "transitional food," as it's called in the language of nutritionists, there is simply nothing better for moving kids from smooth pastes to chunky foods than avocado. It's a great food for young children, offering fiber, protein, a fair amount of several vitamins, and lots of the right kinds of fat to help your baby's brain grow. The coolest thing, though, is that avocados can be served mashed into a smooth puree or in finger-friendly chunks. And let's not forget that avocado is the central ingredient in guacamole — a side dish that the whole family can love. Human beings, especially toddlers, eat with more than their mouths. Smells are important, as are textures, but there's a growing body of evidence that suggests that what an infant or toddler sees may be more important than any other factor in getting her to eat and enjoy a new food. Research published by child psychologist Kristin Shutts in the Journal of Cognition in 2009 suggests that infants display a marked indifference to the sort of things they will put in their mouths — as any parent who has watched their child gnaw happily on DUPLO blocks, mittens, and the dog's tail will attest. According to Shutts, social cues — that is, hearing a familiar adult endorse a specific food and watching them eat and enjoy that food — are more important to getting a 12-month-old to eat a new food than any other factor. Child nutritionist and current child-feeding guru Ellyn Satter puts it a bit differently. "It generally takes children time and repeated neutral exposure to learn to like new food," she says. She advocates "matter-of-factly including the food in family meals and enjoying it yourself without applying outside pressure of any kind." More simply: "Eat with your child, don't just feed him... Children will learn to eat the food their parents eat." But as Donna Quinzi, outpatient pediatric dietician at the Strong Memorial Hospital, explains, getting children to eat what you eat is sometimes easier said than done — especially when parents turn feeding their children into a job rather than a social occasion or a bonding opportunity. Too often, Quinzi says, parents will come to her office "looking for rules and portions" for their children after trying to force or coerce their toddlers into eating things that they themselves don't like to eat. She echoes Schutts when she says toddlers "should be eating what you are eating. It should be a natural thing. It should be interactive. Relax. Ignore behaviors. And don't fight with your child." Parents, in Ellyn Satter's estimation, are responsible for when and where a child eats, and what food is offered. But the children decide how much of that food to eat. And that, as Quinzi pointed out to me, is where frustration sets in. A child who eats a wide variety of fruits, or pasta with a creamy tomato sauce, among other things, does not have eating issues just because he won't eat Brussels sprouts. And turning it into a fight can impact the rest of the child's eating habits as well. "Often," Quinzi says, "you may have a child who has particular likes and dislikes, and families default to foods like chicken nuggets in pursuit of family harmony." Hoping for quiet meals and happy children, parents unintentionally create the situation they come to abhor: their children "won't eat anything else because their parents don't offer anything else," Quinzi says. Satter claims that a cook is likely to stop making a dish — or offering it — after it has been rejected three times. 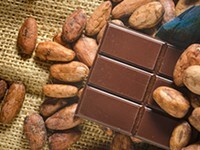 Children, and adults for that matter, often have to be exposed to a new food somewhere between five and 20 times before they accept it into their repertoire. As the parent holding the spoon, or the cook standing at the stove, this disconnect can be hugely frustrating — and many parents and cooks fall prey to the desire to please their audience. Capitulation, bribery, or threats aren't the answer. As Satter points out, and Shutts' research indicates, toddlers are remarkably observant. "Your child," Satter says, "thinks, 'If they have to do all that to get me to eat it, it can't be good.'" What you need is a good propaganda campaign and solid cooking technique. So, back to that avocado. Delicious by itself, it's even better as guacamole, but there's only so much of it that you can eat. Parents need a repertoire of dishes that have enough curb appeal to get little Megan and Devon to eat them while also satisfying the rest of the family — again, selling a new food to your kid only works if you show them that you like it, too. Satter suggests that parents "develop strategies for using high-fat, high-sugar foods," along with toning down "strong tastes with salt, fat, sauces, bread crumbs, herbs, and spices." In sum, the key to getting toddlers to eschew Happy Meals and prepared foods is to learn to cook. Learn to build flavors and use tasty "hooks" like fat and sugar and salt to introduce less-familiar flavors, scents, and textures over time. But, you say, I work all day. I don't have time to cook for a couple of hours when I get home at the end of a day. Leftovers, combined with a couple of pantry items and good technique, are your best friends. The recipes offered here are "starter" recipes for young children; tamed versions of robustly flavored dishes that can be scaled up over time as your child's palate expands. All three dishes start with a crowd-pleasing starch combined with fresh vegetables, and just enough protein, fat, and salt to make them interesting to both you and your budding gourmand. Included in the notes are suggestions for augmenting these dishes over time. For instance, you can add more garlic to your beans and greens, or switch up the baby spinach for escarole or arugula. Only the posole calls for any advance prep work, and even that can be eliminated if you start with a very mild jarred green salsa and use only a tiny amount of it. A few words of advice are in order. First, do not attempt to feed any of these dishes to children who are less than 18 months old: they simply aren't ready to eat solid food like this. Second, I cannot guarantee that your child will eat these dishes, but all three were staples at my table when my now 8-year-old budding chef was just under 2 years old. And he now eats the grown-up versions of these dishes (I still pull the spice punches because he's not quite there yet). Third, don't give up. Be creative and develop recipes of your own based on foods you know your kid will eat — hacked-up chicken nuggets could make some interesting fried rice, for instance. Above all, eat with your children. If they don't see you eating what you are trying to feed them, the battle is already half lost. Eat with them. Talk with them. And when they are old enough, cook with them. You won't regret it. Make a traditional dish like beans and greens more palatable to kids by cutting the ingredients into larger chunks, and putting the liquid into a sippy cup. Beans and greens is a quintessential Rochester dish, so it seems logical that kids should be introduced to it early on. This version uses baby spinach instead of bitter escarole. Spinach is a nutrition powerhouse — and one of those vegetables that routinely tops the lists of foods kids hate. 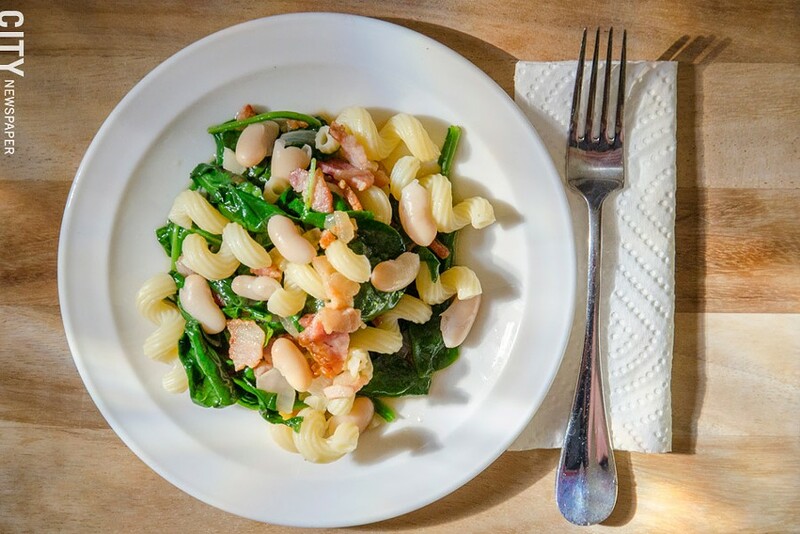 Placing it in the background in a dish full of kid-friendly beans, bacon, and pasta is almost a no-brainer. As kids get older, escarole or arugula can stand in for spinach, garlic can be doubled (or quadrupled), and sweet or hot Italian sausage substituted for bacon. Serve this with crushed red pepper on the side for those with less-timid palates. 8 oz. 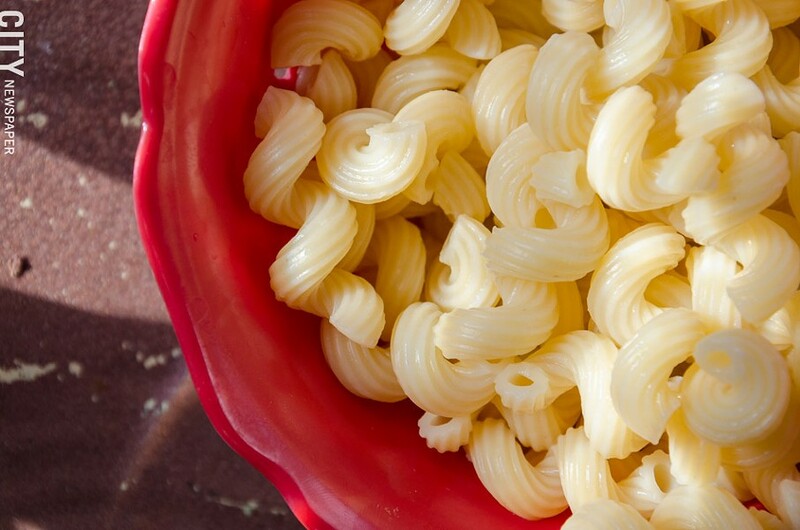 kid-friendly pasta (nuggets, tortiglioni, rotini, fusilli, etc.) cooked according to package directions and drained. 1. Place bacon in a frying pan over medium heat. Cook, stirring frequently until fat renders and bacon begins to crisp. 2. Add onion or shallot and cook until translucent. Add garlic and cook until just fragrant. 3. Increase heat to medium high. Add half (1 cup) chicken stock to the pan, scraping up any browned bits. Bring to a boil. 4. Add beans and remaining stock. Correct seasoning — add salt and/or pepper as needed. Reduce heat to medium and simmer until sauce begins to thicken. 5. Stir in chopped spinach, cover and cook until spinach is thoroughly wilted (five minutes or less). Stir in half of the pasta (you'll have "clean" pasta for your little darling even if she'll eat nothing else). Correct seasoning. Serve. In my house, this was often a default dinner, in part because we almost always have a box of leftover Chinese take-out rice knocking around. The vegetables here are suggestions, as is the meat. If you happen to have tofu around, feel free to substitute it for the meat, but be sure to stir it in gently at the end so that you don't end up with scrambled tofu with rice. The selling point for kids here is the rice and the sweet soy sauce — there are few kids who don't like the combination of sweet and salty, and here we use it to sneak all kinds of good-for-you stuff under the radar. 1. 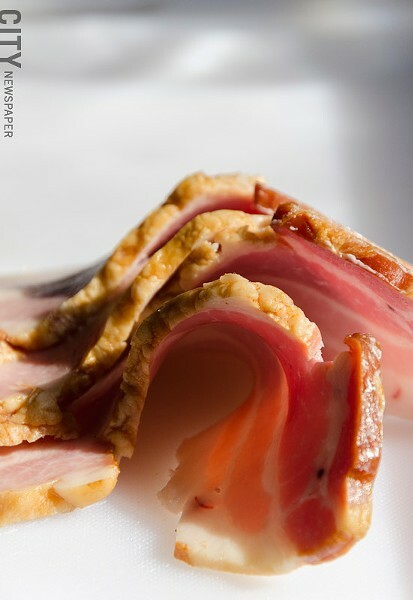 Place bacon in a sauté pan over high heat, allowing bacon to render and begin to smoke a tiny bit. Immediately add onions and carrots. Stir fry until onion is translucent and carrots "brighten" — you will see them get more orange as they cook. 2. Add broccoli and red bell pepper. Continue stir frying until broccoli brightens. 3. Add meat and garlic. Stir fry until garlic is fragrant. 4. Add 2 tsp sweet soy sauce, and mix thoroughly to coat all ingredients in the pan. Do not worry about smoking or sauce burning on the pan at this point, just work efficiently and quickly. 5. Remove pan from heat and immediately add chicken stock, scraping up any browned bits from the pan. 6. Return the pan to high heat and add rice. Stir to combine and allow to fry for a few minutes. 7. Drizzle with remaining sweet soy. Serve with scallions and chopped cilantro to garnish. This is the most complicated of the three dishes here, but it's arguably also the best. Posole is a Mexican stew of sorts in which hominy (a kind of white corn) soaked in lye plays a starring role (don't worry, it's thoroughly rinsed before you buy it, and you'll rinse it some more before we are done). You can substitute a jarred mild salsa verde for the baby salsa verde included here, but making it from scratch is worth the 20 minutes it will take you on a weekend, and you'll have plenty left over to dip chips in once the little nipper has gone off to bed. Use a slotted spoon to dish out some of the posole (it looks a bit like popcorn, which is part of its appeal), shred some of the meat into bite-sized pieces, drizzle a bit of the broth over it, and you've got a very toddler-friendly meal. Serve the soup itself in a sippy cup. As your kids grow up, you can add roasted poblano peppers to both the soup and the salsa, ramp up the garlic and cumin, and serve the whole thing together rather than in parts. 1. Season chicken thighs and dust with cumin. Heat olive oil in a heavy pan over medium high heat. Add chicken and brown thoroughly on all sides. Remove to a plate. 2. Reduce heat to medium. Add chopped onion and cook until translucent. Add remaining cumin and minced garlic, cook until fragrant. 3. Add salsa, scraping up any browned bits from the pan. Add 8 oz. chicken stock and bring to a steady boil, stirring frequently. 4. Reduce heat to medium low. Return chicken and any accumulated juices to the pot. Add remaining chicken stock, cilantro, and posole. Stir to combine. Correct seasoning. 5. Simmer stew over medium low heat for as little as 10 minutes or as long as a half hour (whatever time and patience will allow). Serve grown-up portions garnished with cilantro and lime wedges. The “baby posole” recipe calls for a mild salsa verde. 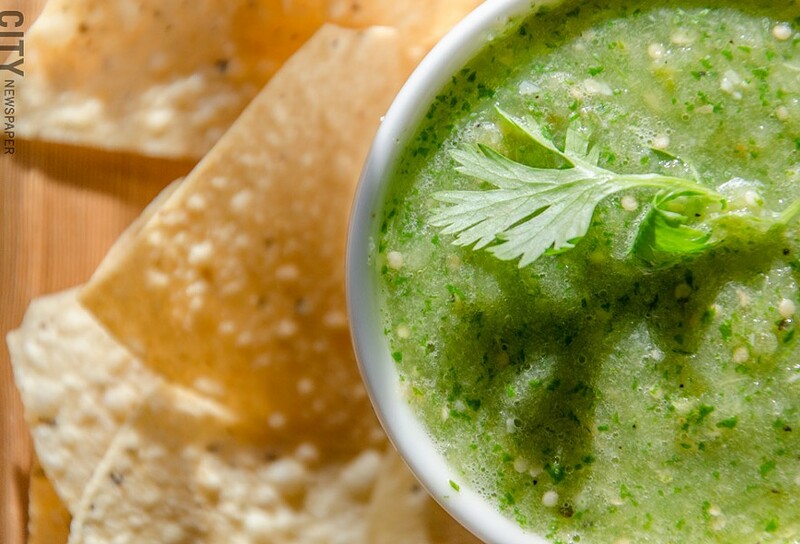 This roasted salsa verde is the most kid-friendly salsa I know. For adults, roast a poblano pepper along with the other veggies, peel it and seed it, and then add it to the mix. The sugar and lime juice are optional here — necessary only if the tomatillos aren't of the best quality. Add more or less of both to taste. If you cannot get fresh tomatillos, canned will do. Bear in mind that they are already cooked, so you can skip roasting them altogether. 1. Place tomatillos, onion, and garlic either directly on a grill over high heat, or on a broiler pan in the oven. 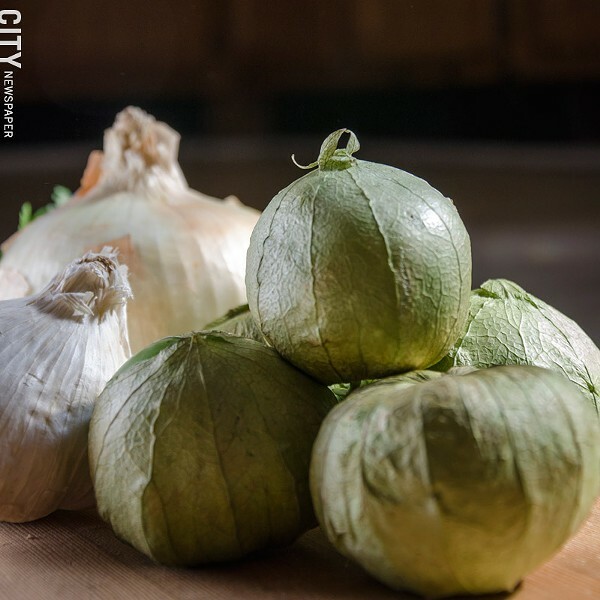 Cook, turning occasionally, until the husks on the onion and garlic are dark brown and the tomatillos darken from bright green to green-brown — don't worry if they look burned on one side, that's acceptable. 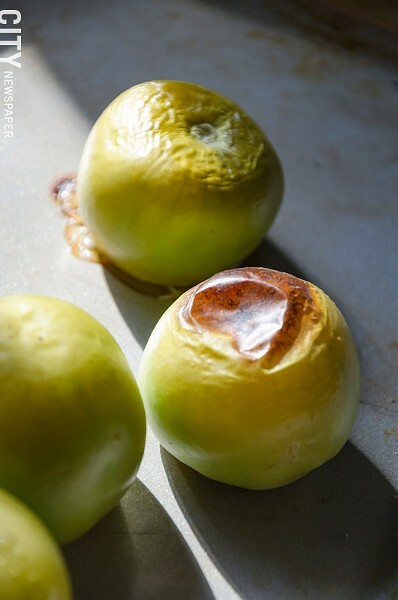 If the skins begin to split, remove the tomatillos immediately. 2. Carefully remove tomatillos to a bowl, making sure not to spill too much of the juice inside them. Place the other vegetables on a plate. Allow all vegetables to cool thoroughly before handling them. 3. Peel onions and garlic and place them, along with the tomatillos and reserved juices, in the bowl of a food processor. Add cilantro and a generous dash of salt. Puree the tomatillo mixture. Taste. Add seasoning, lime, and sugar as needed. Salsa will keep covered in the refrigerator for up to one week, and in the freezer indefinitely. If there is a theme to this edition of Dish, it is "starting early." 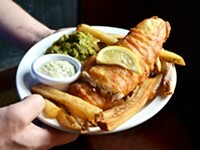 Each of the three features in our annual dining guide refers to that concept in one way or another. UPDATED 5/15/13 to correct addresses for The Distillery and Elmwood Inn. We've all been there. Dale and Ellen Montondo's home in Walworth, just northeast of Penfield, is a cute, cedar-sided number that sits amidst a gaggle of tall pines. The place would seem warm and inviting even without the unmistakable aroma of chocolate that hugs you as you cross the threshold.